'don't be too long' ...so I continued on my way. After I had dropped the shoes in, I made a quick stop at the oppy. 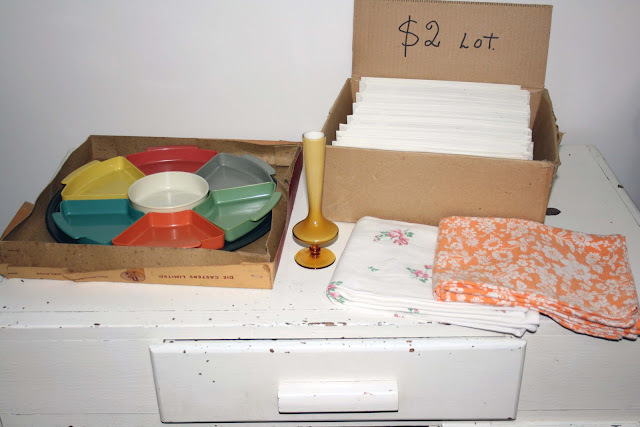 I managed to find a couple of pillow cases for chopping up .50c each, a little vase that I just had to have $3.00 and a box of envelopes-the lot only $2.00 because really, you can never have too many envelopes! A few hours later I headed out to collect the shoes and decided this time I would stop at the garage sale. Most of the stuff had been sold and I was kind of kicking myself I didn't stop earlier. I was lucky enough to pick up this lovely little plastic tray-in perfect condition and still in it's box. I love all the little compartments not to mention the colours!! ! I think it will be GREAT to serve afternoon tea in. Well worth the dollar I paid for it. For more 'Flea Market Finds', pop over to Sophie's blog. Oh what GREAT finds yesterday!! What a good day ... I love those garage sales you must drop into on the off chance. I LOVE that little tray, those colours are fabulous! I wonder if it's the same GS my mum dropped into on the week end, she said she got me some surprises. ps. forget about the kids arvo tea, what about french onion dip, pickled onions (true Douggie style) and some cabana and cheese cubes! Those dip trays are brilliant! Well done on some great finds!